As you may remember in the last blog I stated that my feet were itching. This turned out not to be an urge to start traveling again but instead a mild fungal infection that had flared up, just thought I should clear that up before we go any further. We have the car back!! But the biggest surprise was that it passed the quarantine inspection first time and we didn’t have to pay any extra costs. All the cleaning in Bangkok at Expat Motors seems to have paid off. The inspector said that the underside of the car, (the bit I did), looked like new and couldn’t possibly be the chassis of a thirteen year old Land Rover. The inside, (the bit Megan did) was alright, but nothing special. Actually, that may not have happened. To be totally honest, we sat on the beach while the inspection was carried out. It did feel a little like waiting for your exam results but worse really because if we had failed it could have cost us hundreds of dollars. So the next day we went down to pick the car up and were greeted with the sight you see below. We knew the guys who packed the car in to the container in Bangkok had to let the tires down to get it in, but we were a little surprised to see them totally flat! Never fear though, the winch/air compressor was called in to action for the first time and we quickly had air in the tyres. And after a month without being started Harriet burst into life on the first turn of the key, unbelievable, but true. Anyway, in order for us to legally drive in the land down under we had to get the car tested by the Western Australian Government. The test is carried out at a couple of testing centres around the Perth area and it’s done on a first come, first served basis, so I arrived at 0645 and finally got away at half ten! It took a while but the car passed, just. They check to see if there are any oil leaks and luckily I had one from the gear-box, so it was alright. I felt sorry for the guys in new Toyotas, I doubt they had any leaks and therefore wouldn’t have passed the test. Poor guys, I really felt for them. With the pass paper in my hand I went to the office and registered the car in Australia, woohoo! 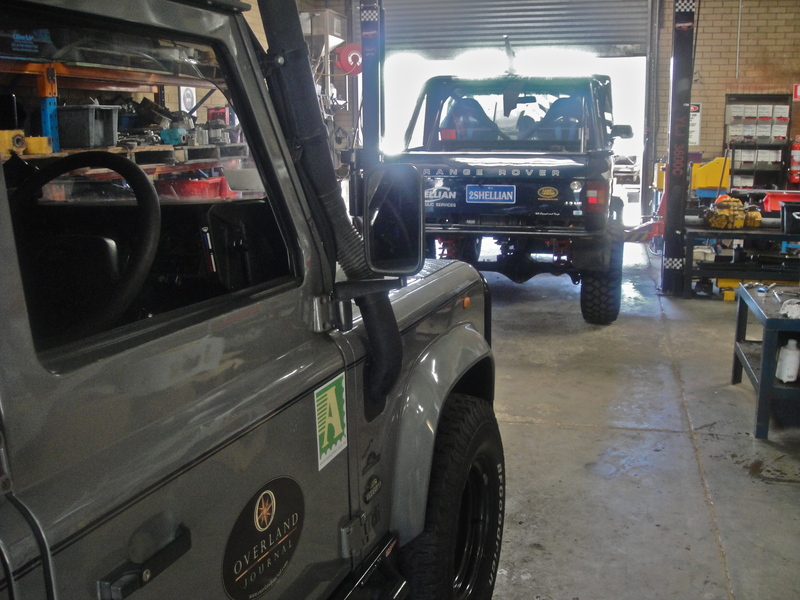 A service was next on the to do list, and luckily for me a very nice man called Ian answered my cry for help on the Australian Land Rover website and offered me his workshop as somewhere I could carry out my service. What I didn’t realise was that he would also fix the bolt that many a Malaysian mechanic could not, and rope his son, Ben into doing all the dirty jobs for me. What a guy. He also has the most amazing collection of Land Rovers and clearly knows his stuff: I asked him which was the gear box and which was the transfer box so that I knew what oil to put where, purely as a test you see, and he knew! Not only that but he also invited us round to his house to meet his better half, Shelley, who gave us food and beer. We both had a really good night and can’t thank Ian enough for all his help, and Shelley for the best meal we have had in Oz. 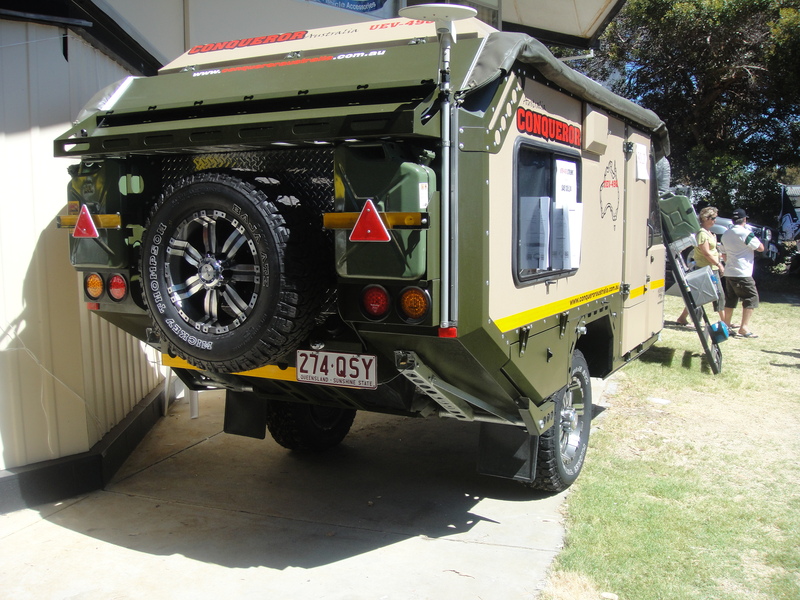 Today we went to the Perth Outdoor Show and saw some amazing 4x4s and camping trailers. Luckily Megan had the wallet otherwise we would have come away with a couple of trailers, a new tent, a Nissan Patrol, and a rather nice blue canoe. Best day ever. That’s it then, after two and a half weeks of waiting and doing Perth four times over we are off tomorrow, if we can find the keys, to meet up with our friend Austrian Tom and set off across this massive country…. Fantastic … well done guys!, 193 days for us before we give up work!, and we’re not doing something as rock and roll as you guys but will be putting our feet up and travelling a bit!… very inspiring guys! Keep the posts coming! Amazing you passed the AQIS test, they do have a abit of ripping people off.